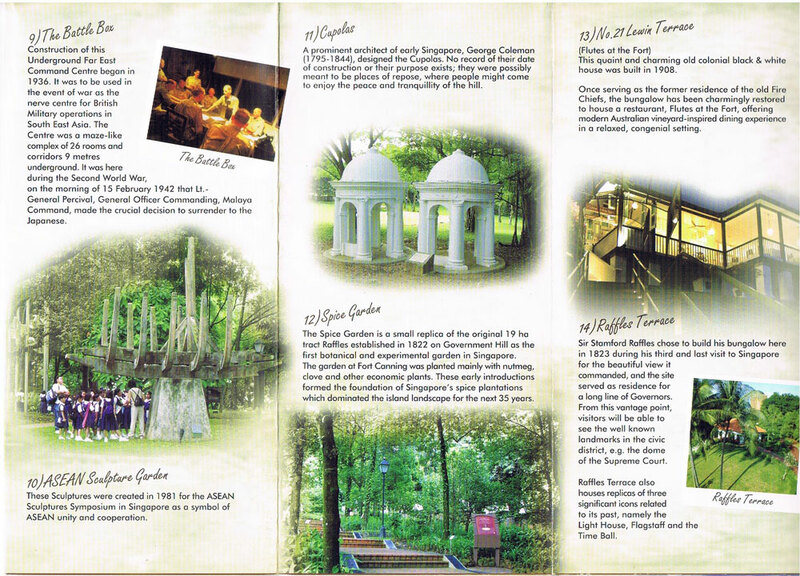 Fort Canning Park is the most historic part of Singapore. Malay and Chinese historical records point to this hill as the center of a kingdom that arose around 1300 AD. The royal palace of ancient Malay rulers probably stood on the summit of this once ‘Forbidden Hill‘. Begin your 14th century walk neor the Keramot Iskandar Syah. Take a leisurely stroll bock in time, to the era of the five kings and the golden age of l4th century Singapore. and gold in the past, the Archaeological Dig showcases an actual archaeological excavation site, the only such exhibition in modern Singapore. Ancient Malay and Chinese sources mentioned that Singapore had a moat and wall. lt ran along the edge ofa stream called ‘Fresh Water Stream‘, which was probably the Parit Singapura (Moat of Singapore). This has now completely disappeared. Part of the moat run up to the side of Fort Canning Hill, but whether this trench here is reloted to the ancient moat is not certain. This was the site of a natural spring which fed the Pancur Larangan, a bathing place reserved for 14th-century Malay royalty and an important source of drinking water for passing ships. 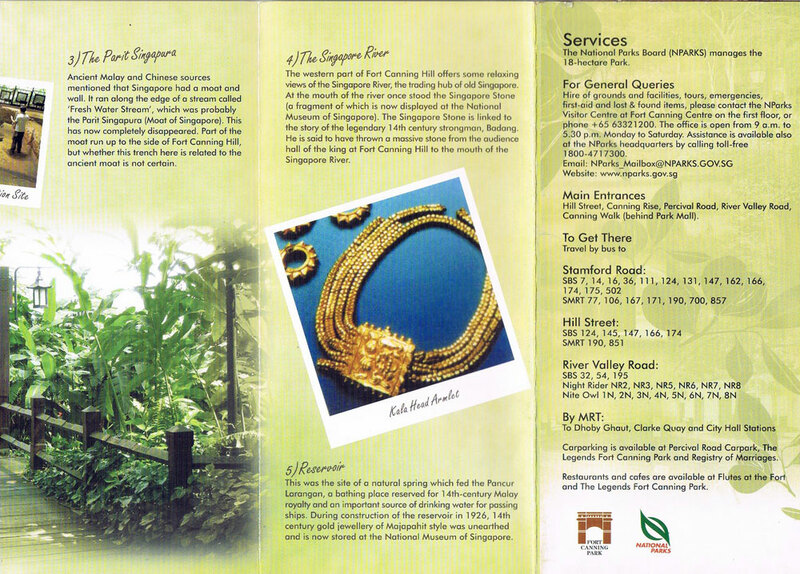 During construction of the reservoir in 1926, 14th century gold jewellery of Majopahit style was unearthed and is now stored at the National Museum of Singapore. 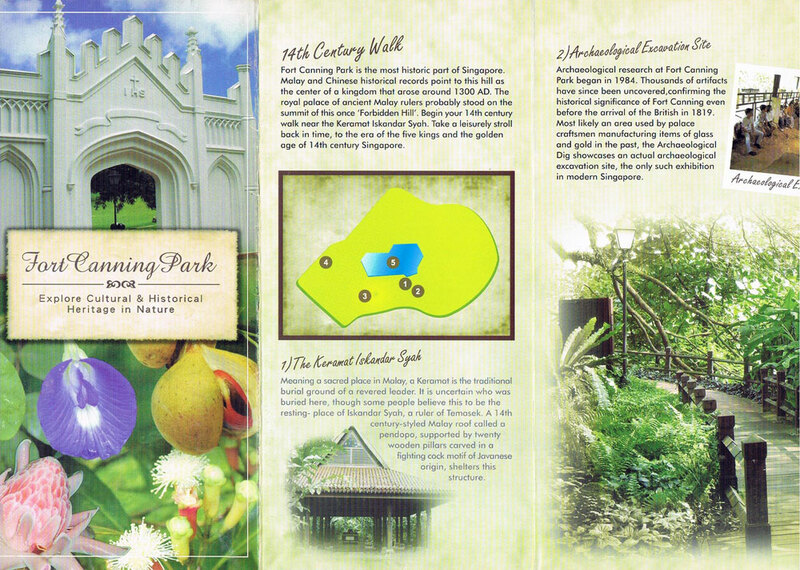 The 19th Century Walk links Fort Canning Park‘s key historic features which recaptures Singapore‘s first century. 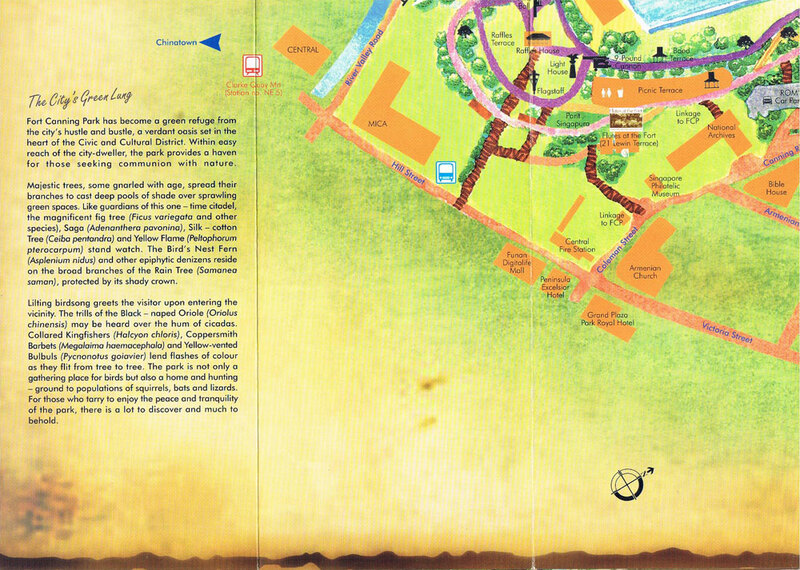 Begin your walk at Dobbie Rise, near the roundabout and information kiosk, about 100 m from Fort Canning Centre. facilities. The Centre is also home to two renowned local establishments, a modern performing arts company Singapore Dance Theatre, and professional culinary academy at-sunrice. The lawn in front of the building, Fort Canning Green is a popular venue for concerts ond music festivals. This is a remnant of the fortress that once occupied Fort Canning Hill from 1861 fo 1926. 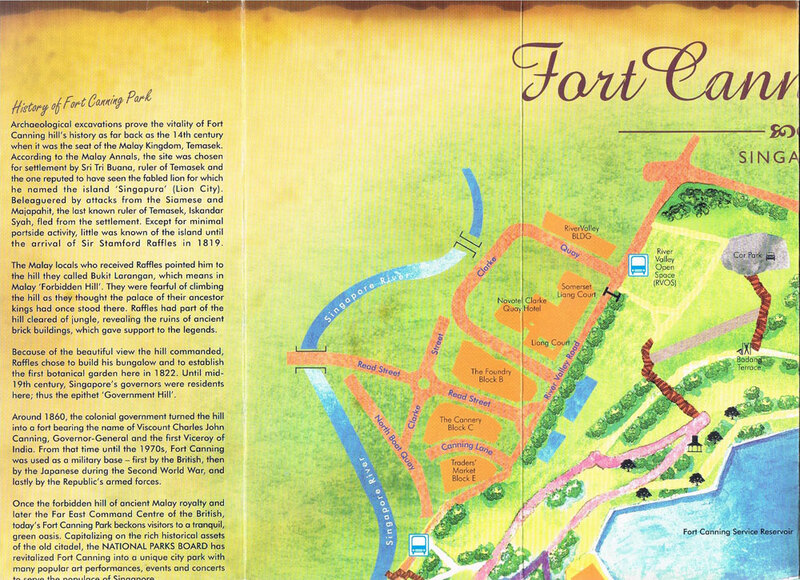 The Fort had 2 purposes: to protect Singapore from attack by sea, and to give Singapore‘s European population a refuge in case of local disturbances. Built by the British in the 1920s, this grand edifice was headquarters for the Far East command and the office of Lt.-General Percival. In 1966 the Singapore Armed Forces converted the building into its premier training institution, known as the Singapore Command and Staff College. 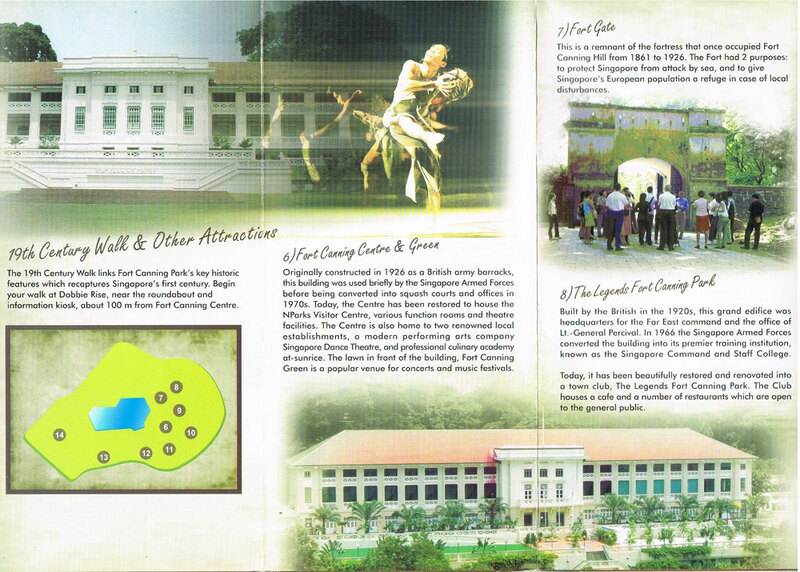 Today, it has been beautifully restored and renovated into a town club, The Legends Fort Canning Park. The Club houses a cafe and a number of restaurants which are open to the general public. during the Second World War, on the morning of 15 February 1942 that Lt.General Percival, General Officer Commanding, Malaya Command, made the crucial decision to surrender to the Japanese. These Sculptures were created in 1981 for the ASEAN Sculptures Symposium in Singapore as a symbol of ASEAN unity and cooperation. A prominent architect of early Singapore, George Coleman (1795-1844), designed the Cupolas. No record of their date of construction or their purpose exists; they were possibly meant to be places of repose, where people might come to enjoy the peace and tranquillity of the hill. The Spice Garden is a small replica of the original 19 ha tract Raffles established in 1822 on Government Hill as the first botanical arid experimental garden in Singapore. The garden at Fort Canning was planted mainly with nutmeg, clove and other economic plants. These early introductions formed the foundation of Singapore‘s spice plantations which dominated the island landscape for the next 35 years. the arrival of Sir Stamford Raffles in 1819. The Malay locals who received Raffles pointed him to the hill they called Bukit Larongan, which means in Malay ‘Forbidden Hill‘. They were fearful of climbing the hill as they thought the palace of their ancestor kings had once stood there. Raffles had part of the hill cleared of jungle, revealing the ruins of ancient brick buildings, which gave support to the legends. Because of the beautiful view the hill commanded, Raffles chose to build his bungalow and to establish the first botanicol garden here in 1822. Until mid-19th century, Singapore‘s governors were residents here; thus the epithet ‘Government Hill‘. Around 1860, the colonial government turned the hill into a fort bearing the name of Viscount Charles John Canning, Governor-General and the first Viceroy of India. 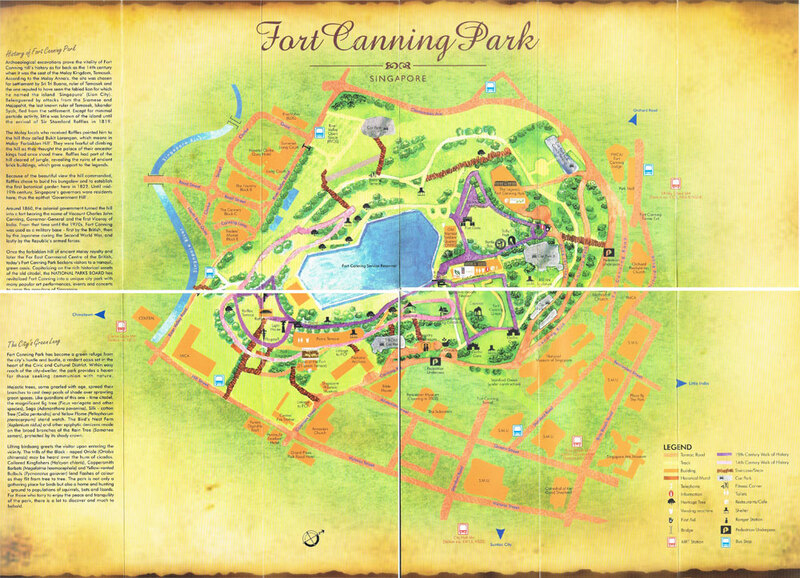 From that time until the 1970s, Fort Canning was used as a military base — first by the British, then by the Japanese during the Second World War, and lastly by the Republic‘s armed forces. Once the forbidden hill of ancient Malay royalty and later the Far East Command Centre of the British, today‘s Fort Canning Park beckons visitors to a tranquil, green oasis. 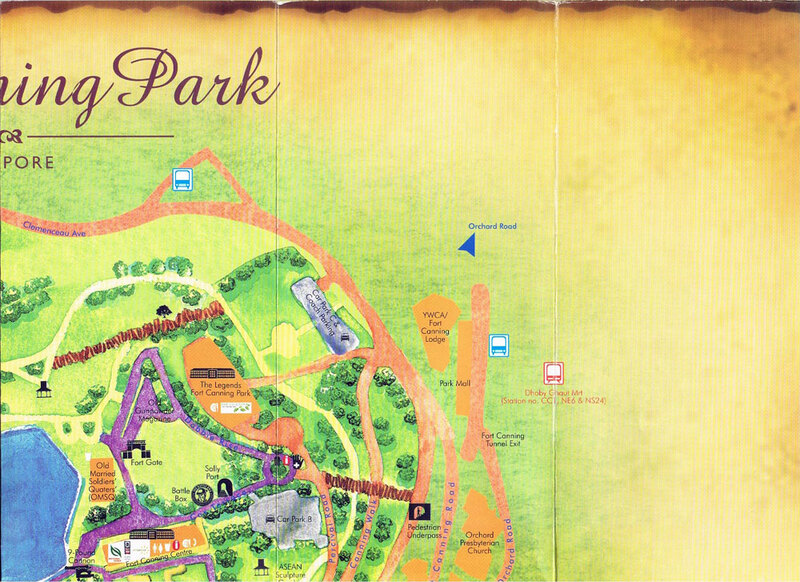 Capitalizing on the rich historical assets of the old citadel, the NATIONAL PARKS BOARD has revitalized Fort Canning into a unique city park with many popular art performances, events and concerts to serve the populace of Singapore. species), Saga (Adenanthero pavonina), Silk — cotton Tree (Ceibci pentandra) and Yellow Flame (Peltophorum pterocarpum) stand watch. The Bird‘s Nest Fern (Asplenium nidus) and other epiphytic denizens reside on the broad branches of the Ram Tree (Samanea samon), protected by its shady crown. Lilting birdsong greets the visitor upon entering the vicinity. The trills of the Black — naped Oriole (Oriolus chinensis) may be heard over the hum of cicadas. Collared Kingfishers (Halcyon chloris), Coppersmith Ba rbets (Megalaima hoemacephala) and Yellow-vented Bulbuls (Pycnonofus goiavier) lend flashes of colour as they flit from tree to tree. The park is not only a gathering place for birds but also a home and hunting-ground to populations of squirrels, bats and lizards. For those who tarry to enjoy the peace ond tranquility of the park, there is a lot to discover and much to behold. The National Parks Boord (NPARKS) manages the 18-hectare Park. Hire of grounds and facilities, tours, emergencies, first-aid and lost & found items, please contact the NParks Visitor Centre at Fort Canning Centre on the first floor, or phone +65 63321200. The office is open from 9 am. to 5.30 p.m. Monday to Soturday. Assistance is available also at the NParks headquarters by cailing toll-free 1800-4717300. Hill Street, Canning Rise, Percival Road, River Valley Road, Conning Wolk (behind Park Mall). 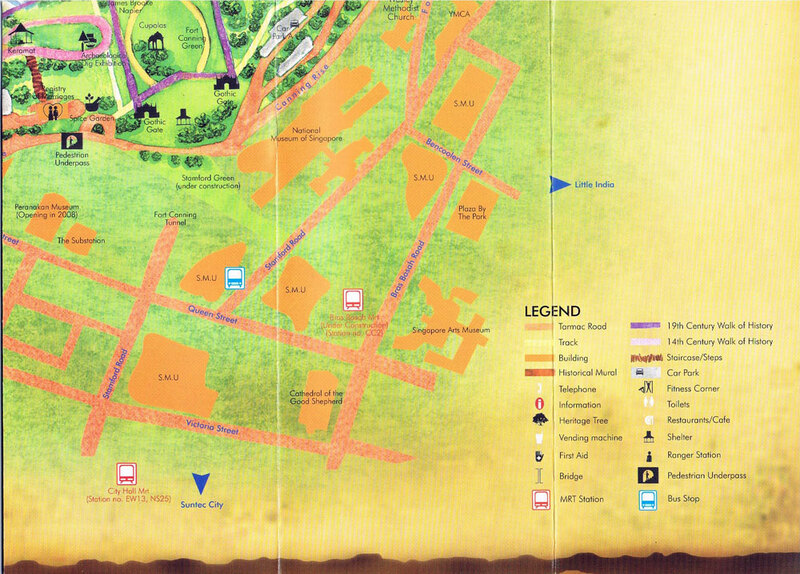 Carparking is available at Percival Road Carpark, The Legends Fort Canning Park and Registry of Marriages. and The Legends Fort Canning Park.